In 1965, in Jackson, Mississippi, racism was still rampant. Civil rights workers from the North had descended upon the state, and the Ku Klux Klan was at its most active since the turn of the century. A lone white woman, Joan, pledged to do her part to make a difference in her world. Joan decided to assist in starting the first Head Start program in the state. This program was to help young black children be prepared to start first grade. During this time, she became passionately involved in the civil rights movement. She marched with Dr. King, demonstrated with protesters against segregation. Her husband, a Southerner, was also supportive of her efforts. Joan sparked an interest in her young daughters in the “cause”. They went everywhere with her, including the marches and demonstrations. She became known in all circles as that “white lady” who helped “the darkies”. One hot summer night, when Joan’s husband was out of town on business, Joan and her two girls were relaxing in their family room. The air was still and sultry, broken only by the constant chirp of cicadas and the occasional far-off barking dog. Suddenly, the slam of car doors and gruff voices shouting shattered the sleepy stillness. Horns honking, curses disturbed the suburban neighborhood. As a brick came flying through the plate glass window, Joan rushed to the front door. Her front yard was filled with men in white hoods! They had erected an old wooden cross in the middle of the grass. She flung open the door, and, in as growly of a voice as she could muster, the petite woman shouted, “leave my home, you bastards!” They hurriedly set fire to the cross on the lawn and fled like faceless cowards into the night. 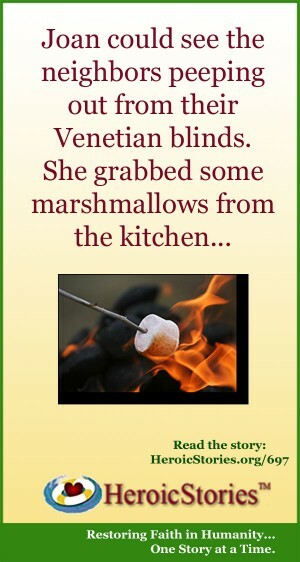 Joan could see the neighbors peeping out from their Venetian blinds. She grabbed some marshmallows from the kitchen, told her oldest daughter to get some coat hangers they had used for a previous cookout. With her two blond-haired children in tow, she marched out to the front yard and proceeded to roast marshmallows by the fire which had been fueled by hate. Slowly, quietly, one neighbor after another joined her small family. The adults whispered quietly, hugging and murmuring as the children cavorted around the fire. The blaze that had been started by bigots was being extinguished by support and love. Joan was my mom and I am the eldest daughter. Her courage will always live in my mind as an example of true heroism. Her fight for racial equality continued until the day she died. Available in The Best of HeroicStories, Volume 1. Thank you for this wonderful story of a truly mature and enlightened soul, whose resourcefulness, ingenuity, love and compassion left an indelible impression on this world, not only in the incident described, but in the constant progress of the world, as it moves from ignorance and immaturity to wisdom and light. I graduated from high school in 1965, with folks who didn’t even know I was in the class. I was so shy and bashful back then that I would have run if someone had so much as said boo to me. But I envy that lady’s courage. As I aged and matured, I became more courageous and have always wished that I could have been able to do the things the marchers and protesters did. But as Maya Angelou said, ‘When you know better, you do better.’ In my life’s work with the local preschools, welfare department, and technical schools, I have done what I could. I’m still doing what I can. What Satan meant for evil, God changed to good!